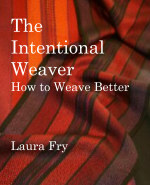 Weaving a Life: Last Time? So. Here I go again. For the 'last' time? I made the decision earlier in the year that I would not accept workshop bookings from guilds. It had all just gotten to be...too much. Too much administrivia. Too much. Better yet, my host/ess are friends of decades and it will be wonderful to go a couple of days early and have a visit. The guild has also offered to help with the conference, so I will be delivering some of the materials they will need. I have just a couple more commitments - other than Olds classes - to finish. And then next year I will be going through all my teaching samples and sorting them into the various Olds curriculum levels, which will make preparing for those classes so much easier. Right now my samples are scattered all over the studio as we emptied boxes and bins looking for textiles for the book. I really need to put them all away again - just can't face that job right now. All of the workshop materials need to go into the mail on Monday so that the drafts and yarns can be distributed to the participants and they can get their looms ready for the workshop the weekend following our Thanksgiving holiday. That may seem 'early', but it's summer, people are away, as I will be for two weeks the end of this month, beginning of next. So this really had to be done before I left. I won't miss the constant juggling of my schedule, keeping an eye on these sorts of deadlines. Who knows, maybe I'll even get to make a few jigsaw puzzles over the winter? Currently reading Beautiful Scars; Steeltown secrets, Mohawk skywalkers and the road home - a memoir by Tom Wilson.